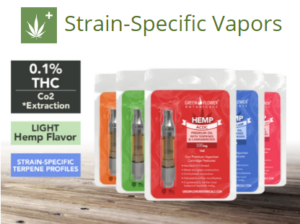 Green Flower Botanicals is proud to offer their new, high potency, full-spectrum CBD hemp oil vape cartridges in a huge selection of medical strains! These Cartridges fit a 510 size pen/battery. They are available in 250mg and 500mg CBD dosages. Vaping CBD provides a quick and convenient method to get your CBD dose quickly absorbed into your body for quick relief. Available strains: ACDC, GrandDaddy Purple, Durban Poison, and OG Kush. .5ml 510 Pyrex premier glass cartridge pre-filled with full-spectrum cannabinoid and terpene-rich hemp oil in a coconut MCT oil base. Stainless steel mouthpiece with adjustable carburetor.